A pancreatic pseudocyst is an accumulation of fluid that is almost always sterile and is rich in digestive enzymes and pancreatic juice that is encapsulated in a wall of fibrous tissue and granulation tissue without an epithelial lining. They are generally oval or rounded. Pseudocysts can develop from complications in the pancreas that lead to obstruction or rupture of a pancreatic duct. We present the case of a 9-year-old male patient diagnosed with a pancreatic pseudocyst with progressive growth due to closed abdominal trauma. Multidisciplinary management determined treatment. Due to the characteristics of the pseudocyst, transgastric endoscopic drainage was used, and the procedure was carried out as described herein. The patient evolved satisfactorily. Pancreatic pseudocysts can be managed surgically or non-surgically, and surgical treatment can be laparoscopic or conventional. Non-surgical treatment can be performed by percutaneous drainage guided by ultrasound or CT or can be drained endoscopically.8,13 If the pseudocyst communicates with the pancreatic duct, it can be treated by endoscopy. The patient was a 9-year-old boy who had fallen from a bicycle and suffered a closed abdominal trauma caused by the impact of the handlebar a month and a half prior to diagnosis and treatment. The patient developed severe abdominal pain, emesis and local ecchymosis, so the hospital nearest to Guaca in Málaga was consulted from which he was referred to the University Hospital of Santander. Abdominal ultrasound documented acute traumatic pancreatitis. Evaluation by pediatricians and pediatric surgeons led to a decision to use medical treatment. Clinical evolution was slow due to persistence of pain and vomiting. Patient was given nasojejunal enteral nutrition starting the fourth week of trauma. A pancreatic pseudocyst of more than 4 cm, progressively growing as the result of systemic inflammatory response, was diagnosed sonographically. An upper digestive tract endoscopy found obvious bulging in the posterior region of the gastric corpus and antrum. A medical meeting of pediatrics, pediatric surgery, interventional radiology and gastrointestinal surgery decided that the patient was a candidate for transgastric endoscopic drainage. The most frequent symptoms of pseudocysts, regardless of their origin, are pain, nausea, fever, weight loss, palpable masses and jaundice. The patient presented here had abdominal pain, a palpable mass and a slight fever. On admission to hospital, laboratory tests showed 702 U/L amylase, 35 U/L aspartate transaminase (AST), and 22 U/L alanine transaminase (ALT). The results for amylase indicated pancreatic compromise. Abdominal ultrasound showed the pancreatic body had grown to 6.5 cm in diameter and with a volume of 25 mL with heterogeneous echogenicity. Several days later, a new ultrasound showed that the volume of the pseudocyst on the pancreatic body had reached 230 mL and a diameter of 8.7 cm. Monitoring of a pseudocyst allows determination of whether it will be reabsorbed or whether drainage is required. Drainage of a pseudocyst is recommended when symptoms persist, when it grows, and when it becomes complicated. After another gastroenterological assessment, it was decided to drain the pseudocyst because of its continued growth. Interventional radiology was requested for sonographic guidance of the procedure. The patient was evaluated and found to be hemodynamically stable and in good general condition. The procedure began by means of upper digestive endoscopy with a lateral view endoscope. 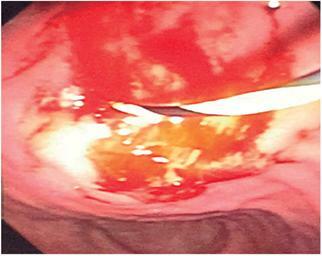 The bulge in the posterior face of the antrum and gastric corpus was identified, with fluoroscopic help. The cystotome was removed and a hydrostatic balloon was used for a dilation to 9 mm and communication was opened between the pseudocyst and the gastric corpus. The dilation balloon was removed and a completely covered self-expanding 10 mm x 80 mm self-expanding metal biliary stent was placed. Its distal crown remained in the pancreatic pseudocyst, but the body of the stent passed through the gastric wall and the proximal cup in the lumen of the stomach (Figure 2). One hundred milliliters of purulent material was drained without bleeding from the wall, without pneumoperitoneum and without any other complications. An endoscopic follow-up on the fourth day after the procedure found a well-positioned, functioning stent. Pain and fever disappeared, oral feeding was resumed and tolerated and inflammation decreased (Figure 3). An ultrasonic follow-up two months after the procedure found that the pseudocyst had completely disappeared. Figure 1 Passage of the hydrophilic guide into the pancreatic pseudocyst before cutting the gastric wall with the cystotome. Figure 2 Fluoroscopic image. 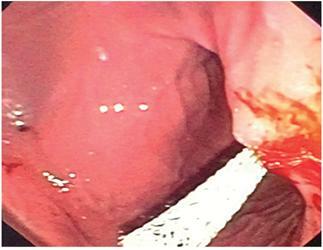 Fully covered metallic biliary stent draining the pancreatic pseudocyst into the stomach. Figure 3 Endoscopic view of the proximal cup of the functioning re-extended stent. 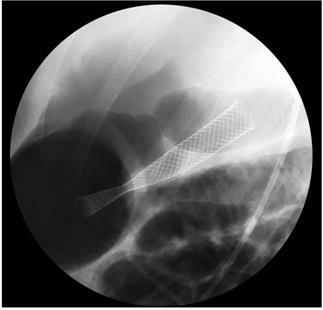 A fully covered biliary stent can be used to maintain the fistula created between the pseudocyst and the stomach open. The stent is easy to remove and unlikely to migrate. Appropriate diagnosis and multidisciplinary management allowed successful minimally invasive treatment of this pseudocyst due to trauma in a 9-year-old patient.